I don’t read all that much on my Kobo when I am at home but it is such a wonderful tool to have when you travel – and makes for very light packing! Usually, I hem and haw for hours over what to bring and can never pack enough to see me through even a week’s vacation; this time, I just brought one physical book (a library book, of course!) and my e-reader, knowing I could download new titles from the library as soon as I finish the old ones. Brilliant! The Unknown Ajax by Georgette Heyer – no vacation could be complete without some Heyer! 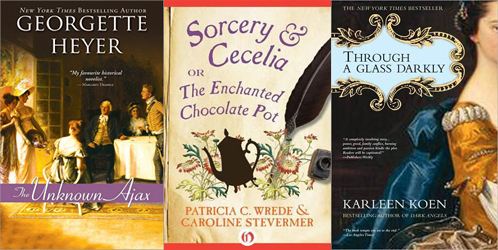 Sorcery & Cecelia, or The Enchanted Chocolate Pot by Patricia C. Wrede and Caroline Stevermer – I’ve been planning to pick this up for a long time, having had several people recommend it to me. From Eva’s review, it sounds like something I’ll love and like the perfect vacation reading. Through a Glass Darkly by Karleen Koen – a historical fiction novel I’ve been meaning to try since high school but have never picked up. Swallows and Amazons by Arthur Ransome – I’m heading to the Lake District this summer and have been excited to revisit these books before I go. 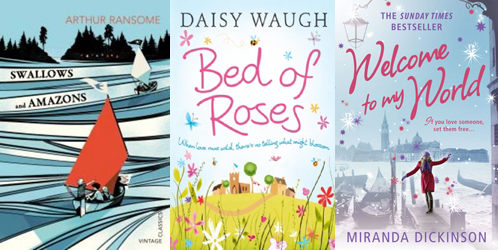 Bed of Roses by Daisy Waugh and Welcome to My World by Miranda Dickinson – some nice, light chick-lit. What a nice bunch of books. Enjoy. The Unknown Ajax has one of my favorite heroes in all of Heyer – I do hope you enjoy it! and I think Sorcery & Cecilia is really clever. I’ve ordered a copy of One Pair of Feet, by the way, after seeing it here & on Barb’s blog. Isn’t Hugo wonderful? I have only read The Unknown Ajax once or twice before but I remember him fondly. Don’t take seeing it here as a recommendation! It has been on my sidebar for ages because I was struggling with in and, since abandoning it, have been too busy to update the sidebar with what I am reading now. I really enjoy Dickens’ fiction but cannot get into her autobiographical works for some reason. I do like the sound of Sorcery & Cecilia! What have I picked up? The second novel by Simone St James. Unfortunately, I didn’t get on all that well with her first novel. Can’t put my finger on why, but I thought I might enjoy it and ordered her second on the quality of writing rather than the actual story in the first one, so I hope I will enjoy more, An Inquiry into Love & Death, so will be starting that soon. I’ve never heard of Simone St James but hope you enjoy the second novel more than you did the first! I read Through a Glass Darkly back in the ?80’s when it first came out, but don’t remember a lot about it. I’m here to encourage you with Swallows and Amazons — if you are not a sailor, don’t let all the sailing instructions bog you down — keep going! The stories really are delightful – I read the whole series aloud to my kids and they are some of our favorites (and none of us knows a thing about sailing!). Recently finished Heyer’s Cotillion, and agree that she is a vacation necessity. 🙂 Enjoy!! The sailing bits were what I loved most when I read Ransome’s books as a kid, Susan! I was very big on detailed instructions then (as, I think, are most kids) even though it turned out sailing was not my favourite way of being on the water. Oh e-readers are the best for travelling aren’t they? A whole library available right at your fingertips! My sister used to own the Arthur Ransome series but I never got into them… that cover you posted is gorgeous! Maybe I ought to try it sometime. I was so hesitant when I bought my Kobo last year but I am so thankful for it now! And, having owned it for a full year now, I have still only purchased one book. Thank goodness for the library! Same here actually! I’ve had mine since the end of last year and have only bought one book too. Bed of Roses has such a cute cover. It makes me want to transport to wherever that is. I will have to look more into this book. I wouldn’t mind a light read. I haven’t ready any of these books before. Enjoy your loot! Isn’t it a cute, light cover? I hope the book turns out to be just as fluffy! Ooh, Georgette Heyer always satisfies the craving for an enjoyable read. The Grand Sophy has been sitting on my shelves since November, and now that my spring break has (finally!) arrived, I should now have time to indulge. Indulge!!! The Grand Sophy is one of my very favourite Heyer novels; I think I know it almost by heart now. The Enchanted Chocolate Pot is on my TBR pile. I often think it will be my next read, but somehow something else always pops up. I hope you enjoy it!